Preliminary design plan for a battleship, identified only as representing a technically "possible" configuration. This design incorporates several major changes from contemporary practice. 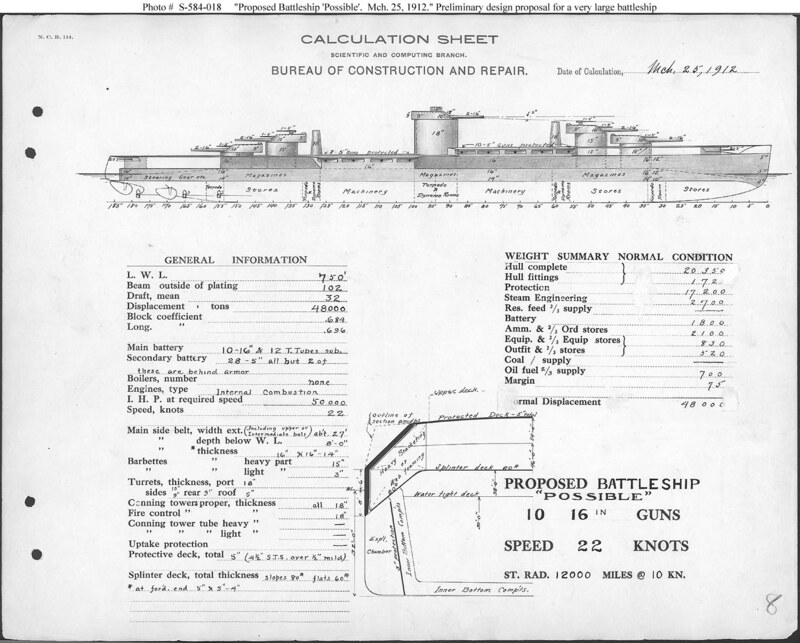 The drawing shows substantially inclined side armor, rather than the typically entirely vertical placement; internal combustion main propulsion, rather than a steam plant; absence of masts and funnels; and the radical installation of a midships turret atop a towering barbette, apparently for greater range and visibility to the target. None of these design features was adopted in a U.S. battleship of this era. 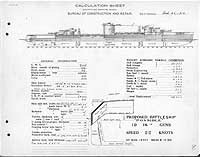 This plan provides ten 16-inch guns, internal combustion machinery, and a speed of 22 knots in a ship 750 feet long on the load water line (L.W.L. ), 102 feet.in beam, with a normal displacement of 48,000 tons.